Your dream home is now one step closer. To reserve a unit, you will be asked to fill up a Reservation Agreement Form (RA) and Buyer’s Information Sheet (BIS). Along with these documents, you will be asked to pay a reservation deposit of Php50,000 for a Prime unit,Terraces and One Pontefino. Php100,000 for Prime Elite, The Mansions and Shophouses unit, and Php50,000 for any other Pontefino project. There are two available payment terms for purchasing your dream Pontefino home. you are required to begin paying your down payment 30 days after the specified reservation date. 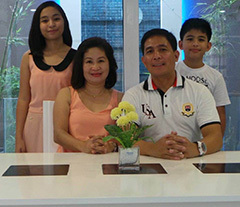 Batangas City is one of the fastest-growing markets in the Philippines. It is a USAID-supported city that is the second largest international seaport in the country after Metro Manila, and has been identified as an industrial growth center in its region. Foreign companies investing their money towards the growth of Batangas City by providing jobs and financial stability for the locale have also improved other aspects of the city’s structure. As the capacity of the Batangas International Port is maximized to strengthen economic ties locally and abroad, so has the widening of the STAR Tollway, which serves to link Metro Manila to the Port. The declaration of local buildings under PEZA (Philippine Economic Zone Authority) Law has also attracted businesses to relocate to Batangas City. With all these improvements fast-tracking Batangas City as the next destination as a major regional urban center, Pontefino Estates is at the forefront of real estate development with its strategic location at the heart of the industrial hub. Pontefino Estates is located right across SM City Batangas. Aside from its strategic location, Pontefino Estates offers the opportunity of premium returns on investments through its leaseback earning program, which gives property owners the chance to earn more than 12% simple annualized return* on their investment. Property owners also get the convenience of a centralized location that is a quick walk away from all the amenities they could ever need. Pontefino Estates’ specialized safety system also makes sure that each resident feels secure at all times through advanced security technology. *based on perceived value and not appraised value. Varies per property.